William Cruickshank was born in about 1828 in Loughborough, Leicestershire. He lived mainly in London and exhibited from 1866 to 1879 at such venues as the Royal Academy and the Suffolk Street Gallery of the Society of British Artists. For example, he resided in Camberwell with his wife Harriet in 1881, and had moved to Camberwell Green by 1901. 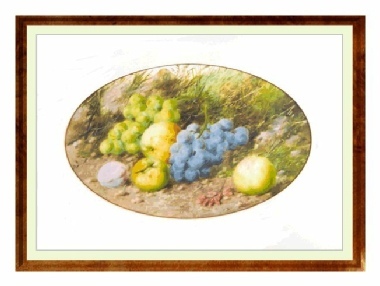 His typical paintings are watercolour studies of still life, most commonly of birds nests, eggs, or fruit on mossy banks. 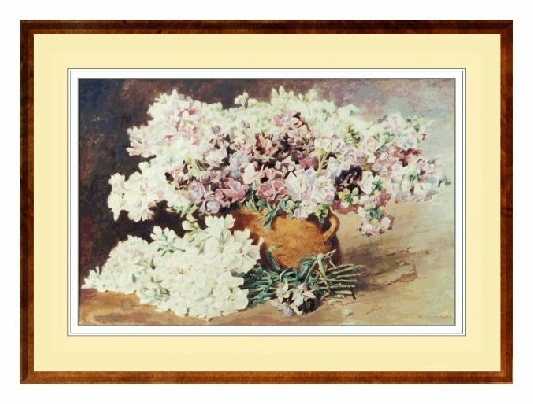 Sometimes his pictures are drawn within an oval mount or frame, and are small and finely detailed. He was a follower of well known artist W. Henry Hunt, whose still life pictures are very similar. An example of the work of William Cruickshank is in the Brighton Art Gallery. The picture above is larger than his normal size and an atypical subject. The painting on the right is a more typical example of his work.